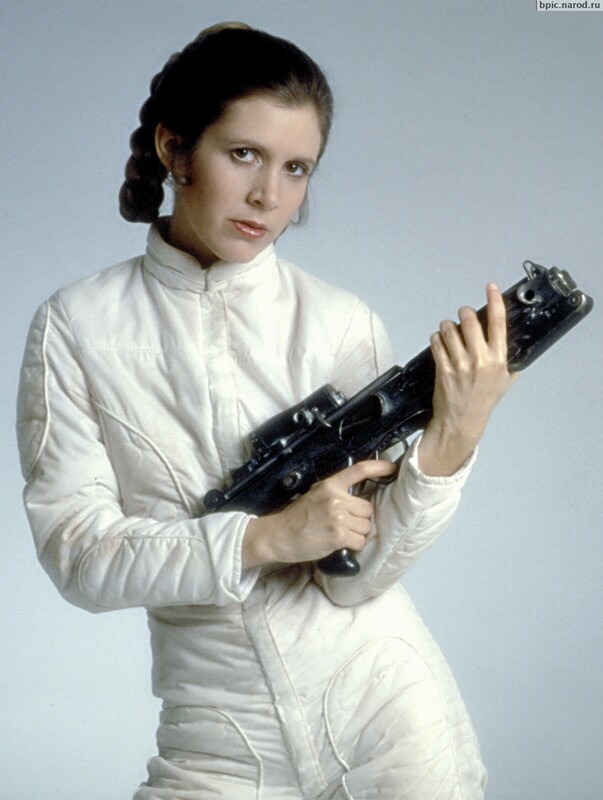 When Carrie Fisher entered the public consciousness like a shooting star, playing Princess Leia in the first Star Wars movie, she was already a showbiz veteran. At age 13, she’d shared a nightclub act with her mother Debbie Reynolds, was in the chorus of a musical when she was 15, and by age 19 had made her movie debut as a nymphet in Shampoo. 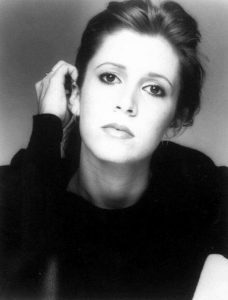 By her 20s, because/despite of her Star Wars fame, her life was in perpetual crisis. She had a serious drug problem from age 22 to 28, and ended up in rehab after an overdose. Following her recovery, she plunged into writing, and for relaxation indulged compulsively in shopping and traveling. To her great credit, she publicly acknowledged her addictions, her battle with bipolar disorder, and her obsessive-compulsive behaviors. 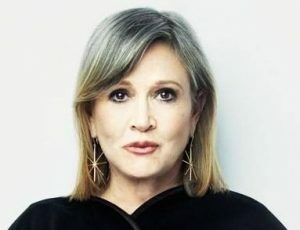 She became a poster child of transparency, whether through her writing or public appearances, meanwhile being a devoted single mother until her death by cardiac arrest at age 60. Carrie Fisher was born on October 21, 1956, at 12:49 pm in Burbank, California. Source: Astrodatabank, Rodden rating AA. Upon inspection, one of the most notable features of Fisher’s chart is that it contains two Parivartana Yogas, something found in only 3% of all charts. The first occurs between Mars in Aquarius in the 2nd house, and Saturn in Scorpio in the 11th house. This is a category called Maha Parivartana Yoga, involving the sign exchange, or mutual reception, of two positive house lords. (The positive houses: 1st, 2nd, 4th, 5th, 7th, 9th, 10th, 11th.) This particular combination of house lords – 2nd and 11th – typically bequeaths positive outcomes re family status, nurture, education, wealth and powers of speech. However, since the 2nd lord Saturn falls exactly (40’ partile) on the nodal axis, some of these very themes are derailed by the disruptive nature of Rahu and Ketu. Thus we see seeds of misfortune within the family, as played out in parental divorce, and the ever-after financial problems for her mother. Here too we see the potential for the substance abuse that dogged Fisher’s life. For any two planets in exchange, we can try to identify a control planet, the one most empowered to swing outcomes in its favor. While Mars is ordinary and aspected by two benefics (Jupiter and Venus), Saturn is ordinary and influenced by benefic Moon and the malefic nodes. Therefore, Mars is better placed, and will thus bend life in favor of its occupancy and rulerships, ie, through powers of expression, accomplished mother, property, and income. The second of these exchange patterns occurs between Venus in Leo in the 8th house, and the Sun in Libra in the 10th house. This is a category called Dainya Parivartana Yoga, involving mutual reception between a trikasthana lord (6th, 8th, or 12th) with any other house lord. Typically, this particular exchange of house lords – 8th and 10th – creates irregularities in one’s social status or career, but also public crises, traumas and transformations. In this case, the control planet is not readily obvious. Venus is ordinary, associated with benefic Jupiter but aspected by malefics Mars and Saturn. The Sun is in mixed condition, debilitated but with dig bala, and under no influence from any other planet. Because the Sun enjoys no other yogas, while Venus participates in a Dharma-Karma Adhipati Yoga with Mars (5th and 4th lords, respectively), we might grant marginal control to Venus. Therefore, it skews life in favor of its occupancy and rulerships, ie, through crises and traumas, but fulfilled through creative work and social activism. Other yogas reinforce some of these themes. The DKA Yoga of lagnesh Saturn and exalted kendra lord Moon in mutual opposition across the 5/11 axis supports creative work and financial reward. The Raja Yoga formed by 7th lord Moon joined with Ketu in a trikona is suggestive of creative consulting. Fisher was involved in several high-profile romances during her life: Harrison Ford during the filming of the first Star Wars movie; Dan Akroyd of Saturday Night Live, whom she almost married; singer & songwriter Paul Simon to whom she was married only a year but remained friends thereafter; and the father of her only daughter, who left her for another man. Passion combinations are pronounced in her chart. Carnal Mars aspects both the Moon and Venus. Lustful Saturn aspects both the Moon and Venus. The 7th lord Moon on the nodal axis invites unusual partnerships. The relationship karaka Venus in the 8th house challenges conventional expectations. Substance abuse is usually seen through the 2nd house. It is occupied by malefic Mars, in Parivartana with 2nd lord Saturn, which is exactly conjunct Rahu associated with drugs and poisons. Although the 2nd house is aspected by Jupiter and Venus, Jupiter itself is an indication of excess, while its lordship of the 12th is a significator of self-undoing. Fisher’s drug problems began shortly after the onset of her Rahu dasha in 1977. The nodes are powerful proxies for planets with whom they associate, or by whom they are aspected or disposited. In Fisher’s case, Rahu is associated with Saturn, aspected by the Moon and disposited by Mars. 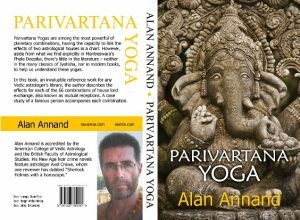 If we look for common ground among those three, we’re back to the Parivartana Yoga discussed above, with all the attendant ramifications. It’s public knowledge that Fisher suffered mental illness. In 1997, she had a psychotic break, tied to her long battle with bi-polar disorder and a change of meds that threw her into an allergic reaction. After ranting and hallucinating for a week, she spent half a year in outpatient recovery. Her mental state deteriorated following the onset of her Jupiter dasha. In its periods, Jupiter gives results for its star-lord the Sun, debilitated in Parivartana with Venus as mentioned earlier. With the Sun weak and both primary benefics in the 8th house, reversals and traumas unfolded, with one step back for every two steps forward. In the D-6 Shashtamsha (reflecting health), Jupiter is ordinary in the 12th house, a dusthana. In the D-8 Ashtamsha (reflecting trauma), Jupiter is exalted but in the dusthana 3rd, aspected by the nodes. Mental illness of one kind or another is often attributed to a disturbance of the manas, that part of our “primitive” mind responsible for sense perception, glandular function, moods and sensitivities. The manas is in turn linked astrologically to the 4th house, its lord, and the Moon. The influences upon them from Saturn, with its anxiety, depression and isolation, and/or Rahu, with its disruption and crazy-making quality, are the two key variables. Fisher’s 4th house is unoccupied, but the 4th lord Mars is in Aquarius ruled by Saturn. In addition, peculiar to this chart, Mars is in Parivartana with Saturn, which accentuates their linkage. Furthermore, once we allow Mars to exchange signs in our mind’s eye, it now occupies the same sign as Rahu, which has a destabilizing effect. The Moon, although both exalted and full, is aspected by Saturn and lies on the nodal axis where it is further destabilized by Rahu. Despite these issues, Fisher was a consummate writer. The 2nd house of “voice” (something to say) is highly energized by its Parivartana Yoga and benefic aspects. The 5th house of creativity is occupied by a full exalted Moon, its power magnified by the nodal axis. And Mercury is exalted in the 9th house of publishing and media work. As per KP theory, dasha and bhukti lords primarily deliver results for their nakshatra lords. It’s worth noting that a third of Fisher’s planets occupy a Sun nakshatra. Therefore, within the cycle of bhuktis, this star-lord influence of a debilitated Sun puts the ego under stress roughly a third of the time. Since the Sun is also involved in a second Parivartana with Venus, this provokes an oscillation between professional success and self-doubt, resulting in crises, mental trauma and repeated breakdowns. Fisher also suffered obsessive-compulsive disorder (OCD), an anxiety disorder in which people have unwanted and repeated thoughts, feelings, ideas, sensations (obsessions), or behaviors that make them feel driven to do something (compulsions). At the heart of OCD is some sort of fixation. Fisher’s chart contains seven planets in fixed signs. From the Chandralagna point of view, we can analyse the manas again. The 4th house (from the Moon) is occupied by Jupiter and Venus, but aspected by fearful Saturn. The 4th lord Sun is debilitated in the dusthana 6th (from the Moon). And the Moon, as we saw earlier, is under attack from both Saturn and Rahu, the two major contributors to mental malaise. 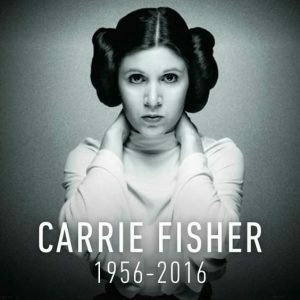 Fisher died on December 27, 2016, while she was running Saturn-Mercury-Saturn. As owner of the 2nd house, dasha lord Saturn is a full maraka. As the occupant (or owner) of the 11th house from a moveable ascendant, it is also a badhaka – a tormentor, or source of obstacles and distress. And since Saturn is swa nakshatra, it works only to manifest its own significations and results. Bhukti lord Mercury acts primarily on behalf of its star-lord the Moon, which as lord of the 7th is also a maraka for this chart. Thus both dasha and bhukti serve to activate the marakas for this chart, which are in mutual aspect on the nodal axis, reflecting the possibility of abrupt reversals for which the nodes are notorious. A remarkable instance of synchronicity by transit was also evident at the time of Fisher’s death. Saturn had completed its second return, while Mars was on the verge of completing its 32nd. Both planets were back in Scorpio and Aquarius, respectively, and therefore both were in Parivartana again. And since both Mars and Saturn are marakas for this chart, their recurring mutual reception was an echo of their natal configuration. Whereas natal Saturn had been conjunct Rahu within less than a degree, transiting Mars and Ketu were conjunct within a quarter of a degree. It was as if the two marakas had dived into a death star and come out the other side. He’s also the author of several non-fiction books. Stellar Astrology offers a compilation of time-tested techniques, in-depth celebrity profiles, and analyses of world events. Parivartana Yoga is a reference text for one of the most common yet powerful planetary combinations in jyotish. Mutual Reception is an expanded companion volume for western practitioners, covering the same subject of planetary exchange through the lens of traditional astrology.